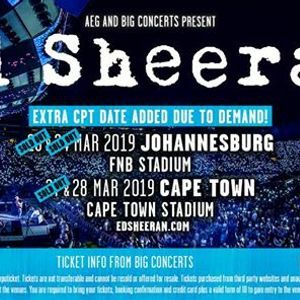 AEG and Big Concerts intends to stump SA with the world renowned artist ED SHEERAN. The event is scheduled to be a dual day invent on 23rd and 24th of march at the FNB stadium Johannesburg and 27th and 28th of March at the cape town stadium. Its a can't miss. For scopes on this event. Follow Party Nerds. This Tuesday, 16th April, 04:00 pm, Sam Smith! The thrill of it all world tour!